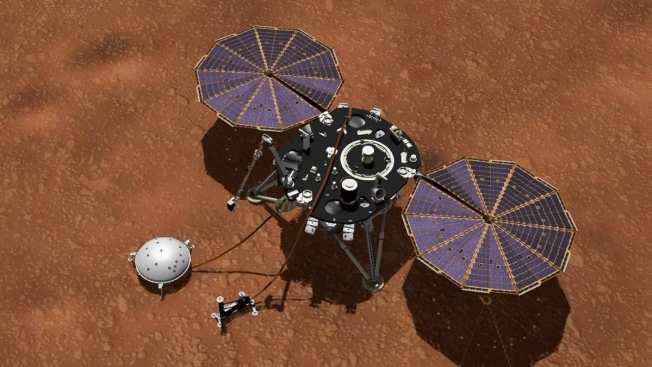 This artist's concept provided by NASA and JPL-Caltech shows NASA's InSight lander with its instruments deployed on the Martian surface. InSight's package of weather sensors, called the Auxiliary Payload Subsystem (APSS), includes an air pressure sensor inside the lander — its inlet is visible on InSight's deck — and two air temperature and wind sensors on the deck. Under the deck's edge is a magnetometer, provided by UCLA, to measure changes in the local magnetic field that could also influence SEIS. And now for the weather on Mars: NASA's newest lander is offering daily reports on the red planet's frigid winter. Starting Tuesday, NASA's Jet Propulsion Laboratory is posting the highs and lows online, along with wind speed and atmospheric pressure from the InSight lander. On Sunday, InSight recorded a high of 2 degrees Fahrenheit (minus 17 Celsius) and a low of minus 138 degrees Fahrenheit (minus 95 Celsius). Compare that with Sunday's coldest U.S. temperature: minus 27 degrees (minus 3 Celsius) in Taylor Park, Colorado. Scientists need to know the local Mars weather to determine if InSight's seismometer is registering real marsquakes or simply wind or pressure changes. InSight landed near the Mars equator in November. NASA's Curiosity rover is also providing weather updates, while roaming around Mars.